Many high achievers, particularly women and people of color, suffer from impostor syndrome, the fear that they don’t belong in the rarefied realm to which they’ve ascended and that they will soon be found out. Even Michelle Obama, who is, according to a Gallup poll conducted in December, the most admired woman in America, has said that she feels it. “I share that with you because we all have doubts in our abilities, about our power and what that power is,” she told students in London in December. Well, maybe not all of us. I’ve just finished Vicky Ward’s “Kushner, Inc.,” a scintillating investigation of Jared Kushner and Ivanka Trump’s White House sojourn, which comes out on Tuesday. It’s full of damning details: contempt for the entitled, venal couple may be the one thing that unites all of D.C.’s warring factions. Still, the first daughter and her husband remain psychologically mysterious, at least to me. Why don’t they have impostor syndrome, given that their total lack of qualifications for the jobs they are doing makes them actual impostors? As political actors, the couple are living exemplars of the Dunning-Kruger effect, a psychological phenomenon that leads incompetent people to overestimate their ability because they can’t grasp how much they don’t know. Partly, the Jared and Ivanka story is about the “reality distortion field” — a term one of Ward’s sources uses about Kushner — created by great family wealth. She quotes a member of Trump’s legal team saying that the two “have no idea how normal people perceive, understand, intuit.” Privilege, in them, has been raised to the level of near sociopathy. To make sense of their motivations, Ward told me, you have to understand the gravitational pull of their fathers. Husband and wife are both “really extraordinarily orientated and identified through their respective fathers in a way that most fully formed adults are not,” she said. Among the most interesting parts of “Kushner, Inc.,” are the chapters about Charles Kushner, Jared’s felonious father, and his plan to restore his reputation, with Jared’s help, after getting out of prison in 2006. Part of that rehabilitation project was the purchase of a flagship building in Manhattan, 666 Fifth Ave., for which the family paid a record amount at the height of the real estate market in 2007. When the recession hit, the building became a white elephant, its debt threatening the family fortune. Ward’s book suggests that the search for someone who would bail out 666 Fifth has played a significant role in foreign policy during the Trump administration. Since the completion of her book, we’ve learned that Trump overrode intelligence officials, who were concerned about Kushner and his family’s ties to foreign investors, to give Kushner a security clearance. 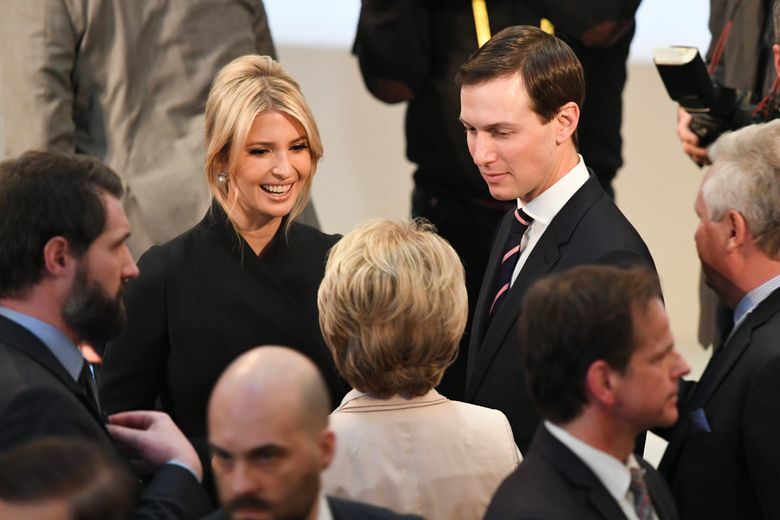 “You’ll notice that the U.S. position toward Qatar changes when the Qataris bail out 666 Fifth Ave.,” said Ward, adding, “We look like a banana republic.” Maybe that’s why Jared and Ivanka appear so blithely confident. As public servants, they’re obviously way out of their depth. But as self-dealing scions of a gaudy autocracy? They’re naturals. Michelle Goldberg is a New York Times Opinion columnist.